Gone are the days when most guys only had a safety razor and shaving foam as a part of their complete shaving kit. A perfect shave requires a few more accessories and with time, more men have begun to opt for best shaving kit off the shelf to fulfill their shaving requirements. A shaving kit generally consists of numerous accessories which are required for shaving. Depending on the quality of the shaving kit, they generally contain a safety razor with a stand, shaving soap with a bowl, along with a shaving brush. A shaving brush is included to help men create lather out of their shaving soaps and creams. The quality of each of the shaving accessories depends on the manufacturer. There are numerous companies out there that offer some of the best shaving kits in the market, companies such as Merkur and Parker are fine examples and their products will be reviewed later in the article. The question is why should you choose to buy a shaving kit when you can pick each and every shaving accessory separately? Less Hassle: For most people, it is highly convenient to choose a pre-assembled shaving kit as it eliminates the hassle of choosing each and everything separately. 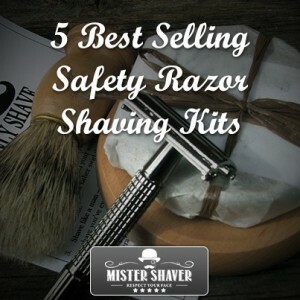 Unless or until a guy is fully aware of each and every detail regarding shaving equipment, it can be quite a task for them to search around for safety razors, shaving brushes, creams, stands, and other shaving accessories just to make up their own kit. It is also better for young men who are just starting to learn the art of shaving to get a kit. Good companies ensure that each and everything in the shaving kit goes well together. Great for Gifts: Shaving kits are also great if you want to give someone a gift; because these kits usually come in a decent kind of package, you can easily wrap it up in gift paper to make it look even better. This generally isn’t possible when you purchase each item separately – unless you’re willing to pitch in some extra cash for a gift box, but it won’t be the same though! Easy to Carry: Having a shaving kit also makes it easier to carry all your shaving equipment around. This is important for those people who travel a lot. Cheaper: In most cases, shaving kits cost generally less than when you buy each of the equipment separately. Nonetheless, there is one disadvantage of buying a shaving kit, and that is the lack of versatility. When buying each item separately, you have the luxury of choosing each and every shaving item as per your needs. You can choose whichever safety razor you like, you can choose a particular shaving brush depending on how soft you want it to be, and you can choose the right shaving foam, cream or gel for your skin type – one that works the best for you. When you buy a kit, you generally have no choice over what is included in them. You’ll have to make do with each and every piece of shaving equipment, regardless of whether you like it or not. Merkur is a well-known brand that creates numerous shaving products such as safety razors, bowls, stands brushes and lots of other products related to shaving. This Merkur kit includes a chrome-plated safety razor, a bowl, shaving soap, a badger brush and a stand for both the brush and the razor. This 5 piece shaving kit is a great gift idea as it includes every basic item that is required for a smooth shave. The badger brush is a plus point – brushes made from badger hair are among the softest and the most absorbent of all shaving brushes. Overall, it’s a well-rounded package. Parker has been manufacturing shaving equipment since 1973, and they’ve gotten really good at it. This shaving kit includes a Parker 96R butterfly open safety razor, a stand, and a pure badger brush. The black and chrome handle of the shaving brush really gives it a unique, quality look and Parker has claimed that this brush will provide barber-like shaves for years to come – and there is no doubt about that, considering the high quality of each of the equipment included in this kit. The stand is made of chrome which gives it a shiny, expensive look – without it being too expensive! This kit is ideal as a gift too. This is another kit offered by Parker that includes a high-quality pure badger brush with a chrome handle. The safety razor is a genuine Parker 22R butterfly open model that gives smooth shaves, and it also looks great. A stainless steel stand is incorporated to help you dry the razor and the brush properly after use. Compared to Parker’s 96R shaving kit which had a black theme, this set has a silver-colored theme. A superb choice for a gift for a father, husband or boyfriend indeed! As its name implies, the equipment in this kit portrays a futuristic look with its satin-finished chrome shaving stand, Merkur Futur adjustable razor, and a silvertip badger brush. Silvertip badger brushes are the best shaving brushes that you can find – they are soft, have wonderful water absorbent capabilities and last for years to come. A glass shaving bowl has also been included in the kit; however, it has the same satin-finished theme to it. 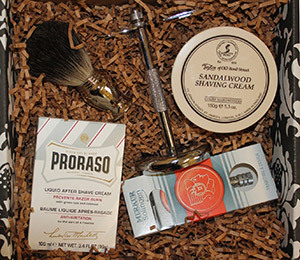 This comprehensive luxury shaving kit is a well-rounded shaving kit. It includes a Merkur classic long handle safety razor along with a 100% pure badger brush that has an elegantly-designed chrome handle. A chrome stand capable of holding both the shaving brush and the razor is also included. Contrary to the other kits reviewed in the article, this kit includes a Taylor of Old Bond Street Sandalwood shaving cream and an aftershave – all this comes in a gift box, making it perfect to be given as a gift. I would like to order a butterfly razor set for my husband. The razor should have a twist handle so it opens up like a butterfly.